Polishology: Manhattan 610K - And Its Next Destination! You may remember awhile back my POST about Manhattan 610K, a German polish that is making its way around our blogging network, and around the world! 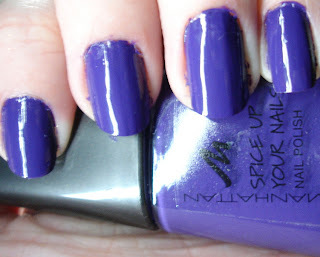 Today I have for you my manicure using this fabulous polish, as well as its next destination! Manhattan 610K is a very gorgeous blue-toned purple creme. While the picture above is artificial light (it was a cloudy, rainy, miserable day), it is fairly color accurate. The application was amazingly smooth, and dry time was great. This is two coats, which was definitely enough to reach full opacity. After the polish dried, I used China Glaze OMG using Konad m57 to create the holo silver fishnet background. 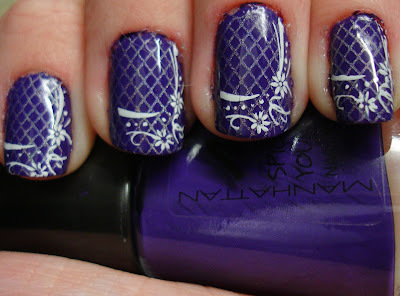 I love this polish as a stamping polish on darker polishes, I can't wait to try it out again! oh I was so close! this is a beautiful polish! 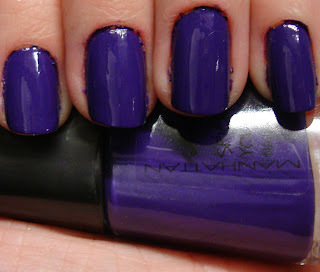 It's a lovely colour and wow, I adore your mani with it! You did a really pretty mani with it! Bummer I didn't get it, it's so beautiful polish! 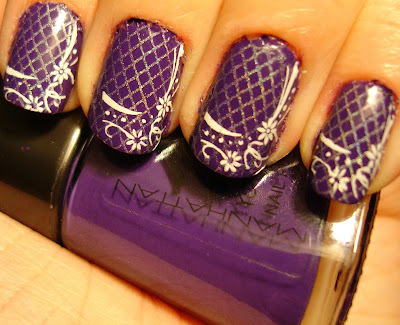 Love the mani! This is such a great color! I'll keep hoping it comes to me!! WOW it looks so great on you, love the konad design you put over it.